When the time comes to look at all the different schools available for your child, it is important to take note of the learning environment of which they will be a part of. It's a good idea to have admissions staff or the head of the school show you around, as this will give you a better perspective of the school and the way it is run. 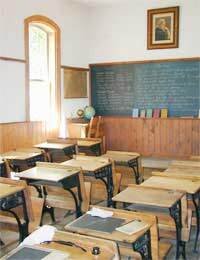 You must remember that the classrooms will be slightly different in a private school environment compared to a state school environment; however the principles when looking at either school classroom remain the same. If you are lucky enough to sit in on a lesson, take note of the way the teacher interacts with their students. This will give you a good idea of how much or how little control the teacher has in the classroom. Obviously it is important to know that the children will (hopefully) be on their best behaviour because of the presence of a visitor, but it still provides a good impression. Perhaps note if the teacher is aware of not just the loudest students, but the quiet ones as well, as the involvement of every single student in the class is needed for successful teaching and learning. Take note of the level of questions that are asked and answered, also any praise and response time to misbehaviour. This will give you an idea of the standard of learning taking place. The layout of the classroom will undoubtedly affect the behaviour of the students that are in it. Don’t immediately think that a vast amount of display boards and materials equals a stimulating environment, sometimes this can be confusing to the students! Often clarity of space and function will help the student understand different sections of the learning environment. For example a reading area which has cushions and a simple sign can help create a calming unintimidating space in which to work in. Every student should have a space to put their work, often with older children this will be in a locker and younger children may have a tray. This will be an appropriate space for individuals to own, and will be the home for their work, letters home and any medication or additional items that they may need. Learning resources for the classroom will vary for different age groups. At a Primary Level, it is important to have bright and colourful educational games and toys, in order to stimulate the young mind. Often a computer will be available for use, helping children with hand eye coordination and to make use of the many online educational resources available. Ask the teacher in the class to show you school books that the children are reading from currently, this will give you a good idea of the standard that the students are at. For older children, brightly coloured equipment is not as necessary. However, display boards and posters are important for every stage of learning as they provide a reference point for students. Again, note the books that are available, also any multimedia packages for the classroom computer to aid with learning. Ask to speak to a student in the class you have observed, this will allow you to ask questions of him or her. Perhaps ask questions of their favourite space in the classroom, or their favourite learning resource, this information will give you a greater insight into the way the classroom is used. Remember; don’t forget to thank the teacher and the class for letting you observe!